DCA CEO/Exec Dir William Doyle tells the MTD Executive Board that his companies are “fully committed” to support the Jones Act. Dredging Contractors of America CEO/Executive Director William Doyle confirmed the support of companies and workers who remove sediment from the nation’s harbors and waterways, assist with marine construction, restore beaches and do other needed water-related work in the upcoming battles regarding the Jones Act, the nation’s freight cabotage law. 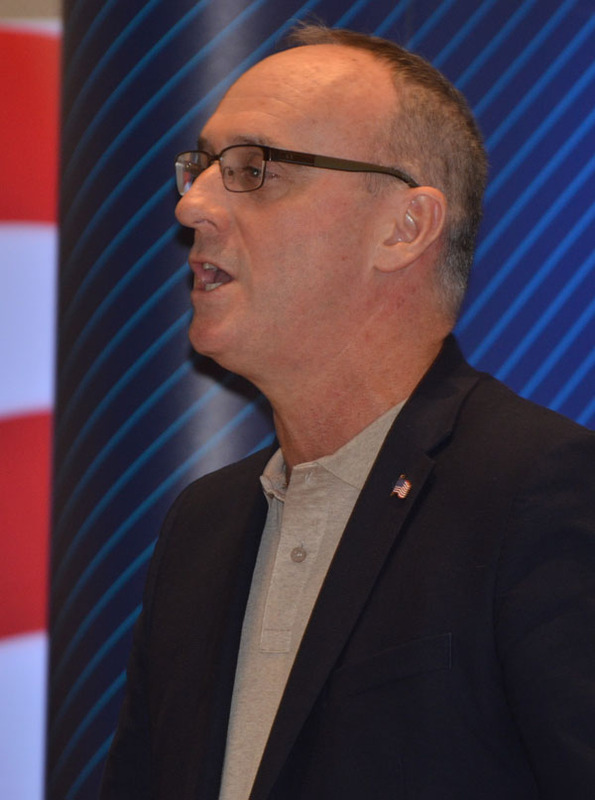 Doyle addressed the MTD Executive Board when it met near Orlando on February 21. A graduate of the Massachusetts Maritime Academy, Doyle sailed as a member of the Marine Engineers’ Beneficial Association before coming ashore for his union. He served for five years as a Federal Maritime Commissioner before going to work with the Dredging Contractors (DCA). “My companies are fully committed – fully committed, my companies’ members and their unions are fully committed to the battles we have ahead with the Koch brothers and Cato in 2020,” Doyle added. With his background as a deep-sea mariner, Doyle reflected that people he has encountered at the DCA “are true patriots.” Like the maritime sector, dredging has come under attack from foreign interests seeking a toehold in the American business model. He said the U.S-flag dredging industry is in the midst of a $1.5 billion capital construction project involving U.S. shipyards. The DCA is a non-profit trade association that has represented the interests of the U.S. dredging and marine construction industry and its members for over 30 years. In order for mariners to “deliver the goods,” it takes more than available tonnage and well-trained seafarers. There also needs to be sufficient infrastructure to support the volume of transiting vessels, as well as adequately dredged ports for vessels to maneuver. The nation’s inland waterways are intricate and full of natural bottlenecks that make the transportation of goods difficult. One of the busiest of these thoroughfares is the Soo Locks, which serves as the gateway between Lake Superior and the lower Great Lakes. The services of the Soo Locks are critical to the transportation of goods across the Great Lakes, and are in dire need of maintenance, upgrading and new construction. Last year, Congress approved and the administration authorized funding for a $922 million Soo Locks project, as part of the America’s Water Infrastructure Act of 2018. The project aims to combine two of the oldest, smaller locks into a new large structure, which will complement the existing Poe Lock that handles the thousand-footers. The future 1,200-foot facility will allow for the passage of more of these large Lakers – which make up 60 percent of the traffic through the locks – along this U.S.-Canadian waterway. But America’s infrastructure needs go beyond widening the Soo Locks. You’d be hard pressed to find an inland waterway or port that isn’t in need of dredging. Deep-draft vessels are limited in the number of ports upon which they can call, due to insufficient dredging. More broadly, refurbishing U.S. infrastructure supposedly has been on the agenda for decades, but you wouldn’t know it based on results. If there’s one issue that should enjoy bipartisan support, it’s the need to improve America’s roads, bridges, airports and railways, its rivers, ports and channels, and most definitely its outdated electrical grids. The MTD, its affiliates and its Port Maritime Councils again call on Congress, the administration, and state and local governments to rebuild the nation’s infrastructure on all fronts. We continue to support the allocation of funds for the Soo Locks expansion. We will fight for the dredging necessary to open up more ports so all types of vessels may conduct business along America’s waterways.